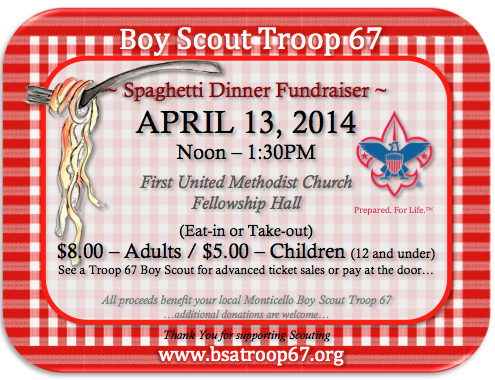 Troop 67 Spaghetti Dinner Fundraiser. Advance tickets are available NOW from any Troop 67 Scout or Scouter. Price is $8 for an adult plate and $5 for a child's plate (ages 12 and under), or you may pay at the door the day of the event. Eat-in or Take-out 12:00 Noon-1:30PM, Sunday April 13, 2014 at the First United Methodist Church old Fellowship Hall. All proceeds benefit your local Monticello Boy Scout Troop. 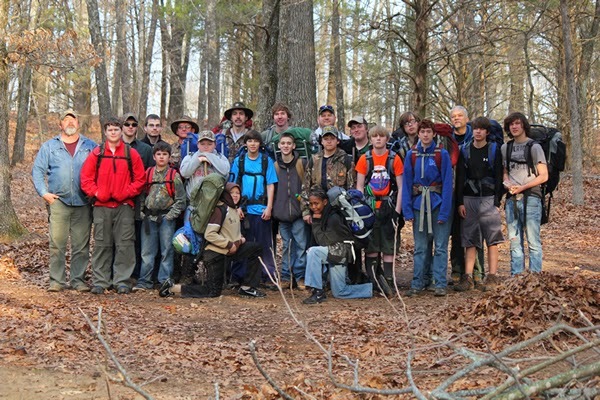 Spring Camporee - April 4-6 at Logoly State Park (Old DeSoto Council Scout Camp). Cost is $32 with t-shirt or $22 without t-shirt. We will meet Friday (April 4th) at 4:00PM in the FUMC parking lot to depart. 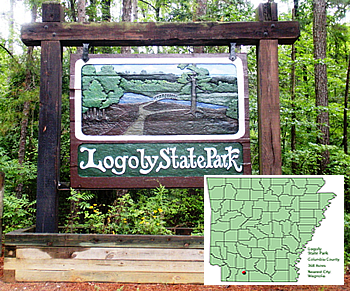 Logoly State Park is about a 2 hour drive from Monticello. Wear your class 'A' uniform for travel, bring your standard camping gear and a sack supper for Friday nights meal. We will return early Sunday afternoon, April 6th. 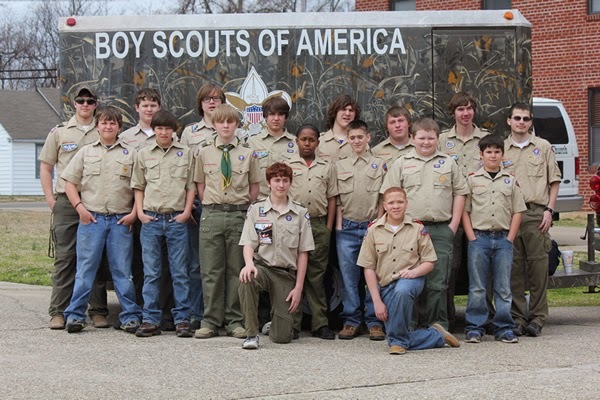 Troop 67 - Make plans to join us on the DeSoto Area Council's Spring Camporee April 4-6, 2014. We will meet on Monday March 31st to make final plans for the trip (after taking Monday March 24th off for Spring Break). We will have more information including the camp cost at the Monday March 31st meeting so plan to attend. Parent Planning Meeting tonight (Monday, March 17, 2014) at 6:30PM, First United Methodist Church for our upcoming Troop 67 Spaghetti Dinner Fundraiser. Advance tickets are available NOW from any Troop 67 Scout or Scouter. Price is $8 for an adult plate and $5 for a child's plate (ages 12 and under), or you may pay at the door the day of the event. Eat-in or Take-out Noon-1:30PM, Sunday April 13, 2014. All proceeds benefit your local Monticello Boy Scout Troop 67. Additional donations are welcome. ORIGINAL POST 3/3: Its time to finalize our plans for our upcoming Butterfield Back-county Hike. If you are planning to go you need to be at tonight's Troop Meeting (Monday. March 3 at 6:30PM, FUMC) or contact Mr. Crook to reserve your spot before meeting time tonight. The Butterfield Trail is A 15 mile loop (12 hour-overnight-hike) through the Ozark Mountains of Arkansas. The trail is named for the Butterfield Overland Express stage coach route and offers a rugged overnight hike in the Ozark Plateau. It begins at Arkansas' Devil's Den State Park and loops southward into the Ozark National Forest and returns to Devil's Den State Park. 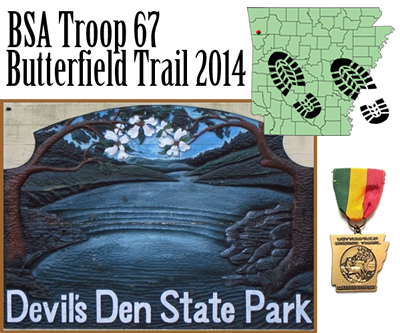 We will make base-camp at Devil's Den State Park Friday night and camp overnight Saturday on the trail. We will be carrying all of our camping gear, food and water with us, so you will need a backpack. 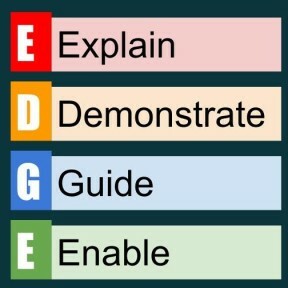 If you do not have one we need to know at tonight's meeting so arrangements may be made to borrow one. We will be hiking in Class B's. The final cost will be set tonight and will likely be between $50-$60. You will need some additional money for travel food and drink. We will be leaving Monticello just after 12:00PM Friday, March 14, which will require early check-out from school that Friday (take note of any schoolwork you will need to makeup on your return on Monday, March 17). Make sure to eat lunch before arriving at the church before departure at 12:30PM. You may want to bring snacks and drink for travel, its a long drive to the park (264 Miles, Estimated 4.5-5 hours drive time - traffic dependent) . We will likely not have cellular service in the mountains; therefore we will not have live web updates from the field. Watch for post once we start home Sunday. Devil's Den State Park is just West of West Fork, AR. off I540 (toward Fayetteville) on Hwy. 74W. For more information you may contact the Park Superintendent, 11333 West Hwy. 74, West Fork, AR, 72774, (479) 761-3325 or visit devilsden@arkansas.com.